What a Bank Holiday weekend we had! Unprecedented sunshine and visitors flocking to the coast and countryside in beautiful Devon. I love this time of the year… everything fresh, new and bursting into flower. 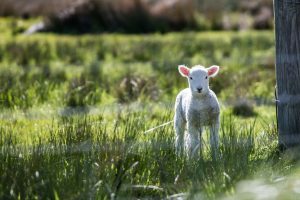 The fields are full of Spring lambs and Exmoor foals are prolific and just gorgeous! There is no better place to be or time to stay in Devon and we have the perfect restaurant with rooms for you to base yourself. The Ginger Peanut in Bampton offers the perfect location from which to explore all that this beautiful area of Devon has to offer. We are ideally placed – not far from Tiverton Parkway station and Junction 27 of the M5 making us easily accessible for whatever mode of transport you choose. 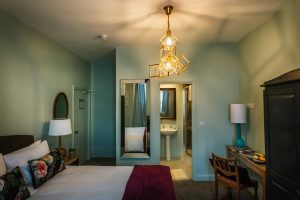 We have 5 gorgeous ensuite bedrooms to choose from with either King or Superking beds and luxury cotton linen so you can be assured of a great night’s sleep. There is a guest pantry for residents to make teas, coffees and enjoy the snacks on offer. You will sleep well at The GInger Peanut! 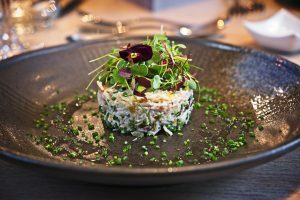 What’s more, we have a superb restaurant offering outstanding seasonal menus all crafted by Peter Mundy, the restaurant owner and chef. Enjoy breakfast, lunch or a delicious dinner in the beautifully appointed restaurant. Or enjoy a cocktail, a glass of champagne, a bottle of wine from our extensive wine list or one of our many gins, vodkas or other tempting drinks on offer. Or you might just fancy a latte and a piece of cake or a Devon Cream Tea with a freshly baked scone and Devon clotted cream. So come and stay in one of our ever so comfy ensuite luxury bedrooms at The Ginger Peanut in Bampton Devon and enjoy the gastronomic delights from Peter Mundy at The Ginger Peanut. You will be assured of a warm welcome and a great experience.